Capillary hemangioma most frequently occurs in cutaneous, subcutaneous, or mucosal tissues, and in those locations it is commonly seen in childhood. It is characterized by elevated, reddish-purple lesions and microscopically by the lobules of capillary-sized channels that are tightly aggregated into nodules nourished by feeding vessels (1). Hemangiomas, either capillary or cavernous, have been rarely encountered in the spinal intradural extramedullary space (1–7). Despite the rarity of hemangiomas in this space, early recognition is important because of the risk of hemorrhage, which may produce sudden neurologic deterioration (5). To our knowledge, MR imaging findings of this entity have not been well described. We present the MR findings of three pathologically proven intradural extramedullary capillary hemangiomas. Sagittal T1-weighted (A), T2-weighted (B), and contrast-enhanced T1-weighted (C) MR images show a well-defined solid enhancing mass within the thecal sac at the L1 level. A vertical linear enhancing structure within the thecal sac, as seen on C, is presumably due to a radiculomedullary vein rather than a compressed root with breakdown of nerve-blood barrier. On a photomicrograph of capillary hemangioma (D), the excised tumor consists of lobules of small capillary-sized vessels (C) separated by fibrous septa (S). Note a feeding vessel (F) with larger caliber size and medium-sized branching vessels (B) (H&E, ×40). A 28-year-old man presented with left gluteal and back pain developed 1 month prior to admission. On physical examination, motor strength of both lower extremities was decreased, in association with paresthesia. Straight leg raising of the left lower extremity was 60°, and that of right lower extremity was 90°. MR imaging of the thoracolumbar spine showed a well-circumscribed intradural mass at the L1 level. This mass was located in the posterior portion of the dural sac, displacing the cauda equina anteriorly. The mass was isointense relative to the spinal cord on T1-weighted images and slightly hyperintense on T2-weighted images. On contrast-enhanced T1-weighted images, the tumor showed strong homogeneous enhancement. Preoperative diagnosis was either neurinoma or meningioma. At surgery, a 1.5 × 1.0 × 1.0- cm3 bright pinkish smooth mass was found to be densely attached to the cauda equina with no dural attachment. The tumor was totally removed. Histologically, the mass comprised a proliferation of capillary-sized vessels lined by flattened endothelial cells, and the mass was composed of nodules of small capillary-sized vessels supplied by a feeding vessel, indicating capillary hemangioma. Sagittal T1-weighted (A), T2-weighted (B), and contrast-enhanced sagittal (C) and axial (D) T1-weighted MR images demonstrate a densely enhancing extramedullary solid tumor on the right side of the thecal sac at the T5–T6 level, causing compressive myelopathy. A 52-year-old man noticed that claudication developed after long walking. Physical examination revealed decreased motor strength of both lower extremities along with hypesthesia and paresthesia. Straight leg raising of the left lower extremity was 45°, whereas that of the right lower extremity was 30°. MR imaging of the thoracic spine showed an ill-defined extramedullary mass within the dural sac at the T5–T6 level. The mass was posterolateral to the spinal cord, compressing it. 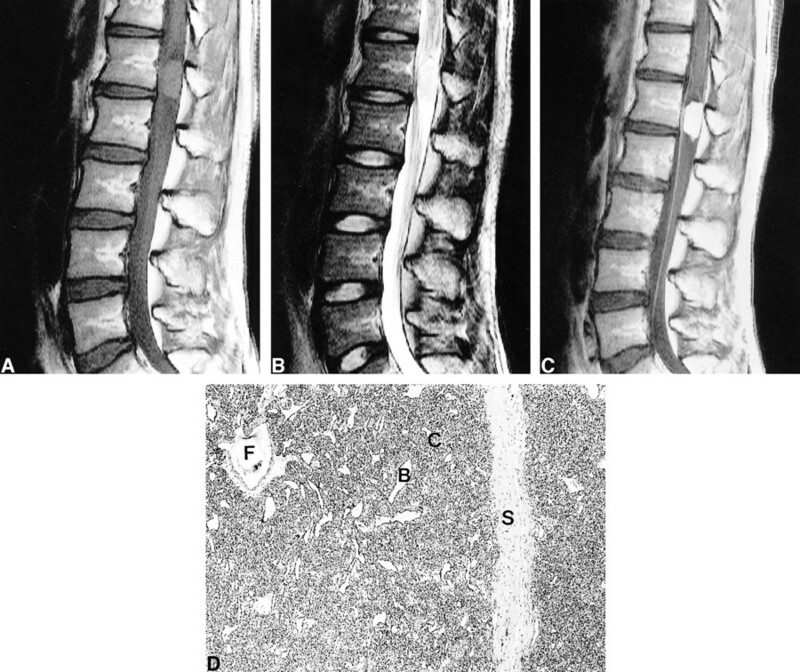 The spinal cord showed a focal, ill-defined area of hyperintensity just above the tumor, suggesting compressive myelopathy. On contrast- enhanced T1-weighted images, the tumor revealed homogeneous enhancement associated with enhancement of the adjacent dura (dural tail sign). Preoperatively, the tumor was diagnosed as meningioma. At surgery, a 1.5 × 0.5 × 0.5-cm3 reddish mass was noticed within the dural sac, densely attached to the inner surface of the dura matter. The tumor was totally removed. Microscopically, the mass exhibited a lobular configuration on low-power examination. The mass consisted of small vessels of capillary caliber lined by flattened mature endothelial cells. The histologic features were similar to those in Case 1. 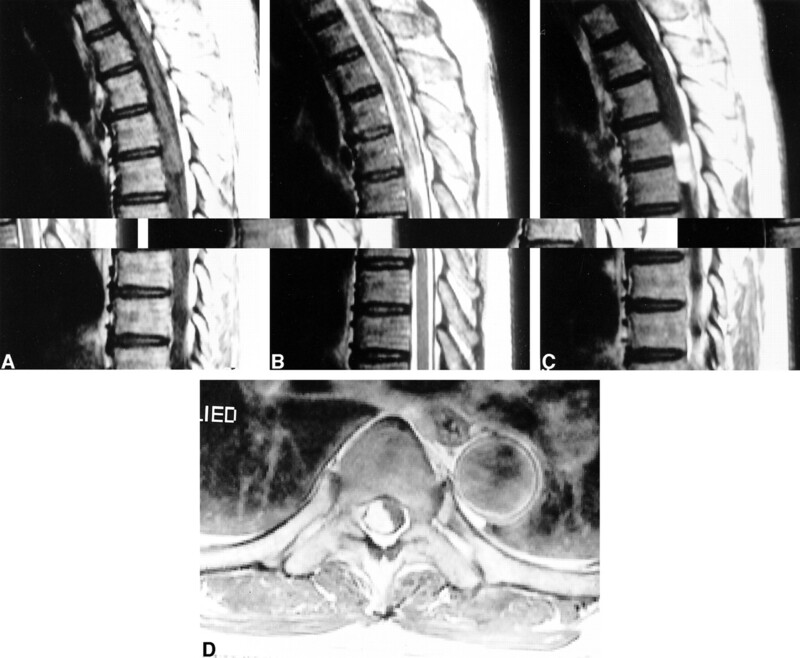 Unenhanced sagittal (A) and contrast-enhanced sagittal (B) and axial (C) T1-weighted MR images show a markedly enhancing intradural extramedullary mass displacing the spinal cord anteriorly at the T4–T5 level. A 51-year-old man was hospitalized in our institution for evaluation and treatment of claudication and radiating pain to both lower extremities. These symptoms were aggravated 1 day prior to admission. Physical examination confirmed decreased motor strength of both lower extremities in association with hypesthesia and paresthesia at the area below the T5 level. MR imaging of the thoracic spine revealed a well-demarcated, intradural extramedullary mass at T4–T5 level. The mass was attached to and broadly based on the posterior dura matter, compressing the cord and displacing it anteriorly. The preoperative diagnosis was meningioma. At surgery, a 2.0 × 1.0 × 1.0-cm3 bright reddish mass with a smooth surface was observed within the dural sac, and was attached to the dura. Gross total removal of the mass was performed. Histologically, the mass was composed of capillary-sized small vessels of lobular configuration. Each vessel was lined by flattened mature endothelial cells. The histologic features were similar to Case 1; however, the density of vascular channels was less, and intervening connective tissue was more abundant. Spinal intradural extramedullary hemangiomas are rare. To our knowledge, only 16 cases of spinal intradural extramedullary capillary and cavernous hemangiomas have been reported (2–7). In the spinal intradural extramedullary space, hemangiomas may arise from the blood vessels of the nerve roots in the cauda equina, the inner surface of the dura, or the pial surface of the spinal cord (1–7). In our cases, it was found that the nerve root of the cauda equina is the site of origin in case 1 and inner surface of the dura matter in cases 2 and 3. Either capillary or cavernous hemangiomas usually behave as space-occupying masses, producing chronic progressive myelopathy or radiculopathy leading to motor and sensory deficits frequently associated with pain (1–7). Also there is a significant risk of bleeding, resulting in sudden neurologic deterioration with associated hematomyelia or subarachnoid hemorrhage (5). Our three patients had either radiculopathy or myelopathy leading to motor or sensory deficits, but no bleeding. MR imaging findings of spinal intradural extramedullary capillary hemangioma have been described in eight cases (1–4, 6). Holtzman et al (1) described a capillary hemangioma of the cauda equina, which demonstrated homogeneous enhancement but the signal intensity on T1- and T2-weighted images were not documented. Zander at al (2) reported a 1-cm intradural capillary hemangioma intimately associated with a nerve root at the L4–L5 level that had heterogeneous hyperintensity on T1-weighted images and homogeneous hypointensity on T2-weighted images, which corresponded to a hemorrhagic focus that was identified histologically. Hanakita et al (3) described a capillary hemangioma of the cauda equina that was slightly hyperintense on the T2-weighted image and enhanced homogeneously. In a report of an intradural extramedullary cavernous hemangioma (4), the mass showed inhomogeneous hyperintensity on both T1- and T2-weighted MR images. In our three cases, the signal intensity of the tumor was isointense on T1-weighted images and hyperintense on T2-weighted images, which is slightly different from that of the previous reports (1–4); however, all lesions showed strong homogeneous enhancement, in accordance with the previous reports. MR imaging findings of this abnormality in a recent report (6) were similar to those of our cases. Our MR imaging findings corresponded well to the microscopic appearance of nodules composed of small capillaries and no evidence of subacute or chronic hemorrhage. The most common intradural extramedullary tumors are neurinomas and meningiomas, both of which show marked enhancement on contrast-enhanced T1-weighted images. In neurinomas, the signal intensity usually is hypointense, less frequently isointense, on T1-weighted images, and hyperintense on T2-weighted images. Cystic change or necrosis is not infrequently seen within neurinomas. If there is no cystic change or necrosis within the tumor, neurinoma is difficult to differentiate from hemangioma, as seen in our case 1. In meningiomas, the mass usually shows isointensity or slight hypointensity on T1-weighted images and isointensity or slight hyperintensity on T2-weighted images. It usually has broad-based dural attachment and frequently shows the dural tail sign on contrast-enhanced study. The signal intensity may be helpful to differentiate between meningioma and hemangioma, but the presence of the dural tail sign appears to be not useful for the differentiation between these two, when the hemangioma arises from the inner surface of the dura matter, as in our cases 2 and 3. Preoperatively, we did not make the correct diagnosis in any of these cases. Intradural arteriovenous malformations are distinct from intradural extramedullary capillary hemangiomas both radiologically and clinically. Arteriovenous malformations are readily diagnosed with MR imaging by demonstrating vascular flow void. Hemangioendothelioma, which has been described to be intermediate between hemangioma and angiosarcoma and rarely occurs in the spinal intradural extramedullary space, has MR imaging findings similar to those of capillary hemangioma (8). Other intradural extramedullary tumors including paraganglioma, film terminale ependymoma, drop metastasis, sarcoidosis, and lymphoma should be included in the differential diagnosis. Paraganglioma rarely occurs in this space and may show heterogeneous salt and pepper appearance due to vascular signal voids on MR imaging. If not, however, it can not be differentiated from capillary hemangioma (9). In film terminale ependymoma, intratumoral cystic change may be seen and the degree of contrast enhancement usually is less strong, which may help differentiate from capillary hemangioma. Drop metastasis usually appears as multiple small nodular and/or linear enhancing lesions within the thecal sac (10). In sarcoidosis and lymphoma, the lesion may be seen as a discrete solitary mass, but more frequently appears as a multifocal patchy or linear enhancing lesion (10, 11). In conclusion, when a well-demarcated, strongly enhancing mass is observed in the intradural extramedullary space of the spine, capillary hemangioma should be included in the differential diagnosis. ↵1 Address requests to Kee-Hyun Chang, M.D., Department of Radiology, Seoul National University College of Medicine, 28 Yongon-dong, Chongno-gu, Seoul 110-744, Korea.